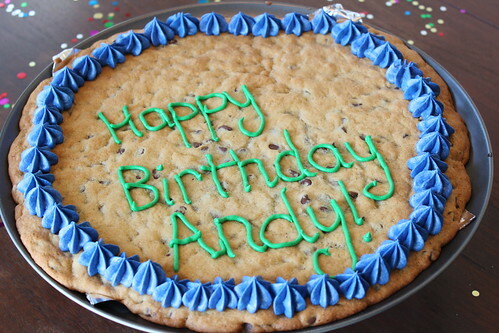 Three years ago, I made an ugly chocolate chip cookie cake for Andy's birthday. It tasted great; it was the perfect ratio of soft to chewy and had the sweet richness that every chocolate chip cookie should aspire to. Sadly, the frosting I used last time left everything to be desired, and since then I've been itching to remake it with frosting that really does the cookie justice. Luckily, he requested another one for his birthday this year, so I finally got my chance! I wrote last time about how I was bummed at the dearth of Mrs. Field's copycat recipes on the internet. I hoped that searching again a couple years later would yield me better results, but it didn't. Happily, I had much more success with the frosting this time. I'd say this actually comes close to my beloved Mrs. Fields frosting. It was easily pipeable and held its shape great, even on a warm day. And although I hate shortening and hesitated to use it, I couldn't even tell that it was the key ingredient. Click here for the cookie recipe! Combine all ingredients except food coloring in the bowl of a stand mixer. Beat on medium-high speed until smooth and stiff, 4-5 minutes. Stir in food coloring and pipe onto cake. I am starting to prefer what I call "cookie pies" over regular cakes. This looks great! Wow. I found your blog on line looking for the perfect frosting I remember on store cookie cake. This was perfect!!!! Thank you! Made this frosting tonight and it was perfect. Thanks! Perfection! Held up exactly as it should for this purpose. Love using butter over shortening.. but in this case, you need the shortening to not weep. Will you need to refrigerate the frosting because of the milk? Just made it and tastes delicious!!! But what about the chocolate cookie cake frosting? It's a million times better than the vanilla and I can't find a decent receipe anywhere.